Facial Exfoliators are extremely important when caring for your skin. They remove all the layers of dead skin cells, deep clean your pores and renew the appearance of your skin. This also allows your moisturizer or other treatments to do a much better job. A good exfoliator can brighten, smooth, soften and reduce the signs of aging. Add one of these natural facial exfoliators to your skin care routine. Trilogy Gentle Facial Exfoliant This is another natural product that I just love. Trilogy facial exfoliator gently polishes and reduces the appearance of pores without scratching or irritating skin. It is suitable for all skin types but is especially beneficial if you have aging skin. Honey Enzymes and Camellia Oil both remove the outer layers of dead skin cells and Jojoba Beads gently buff them away preventing dull tired looking skin. Sweet Almond Oil, Rosehip Seed Oil and Primrose Oil moisturize and provide nutrition, Macadamia Nut and Calendula Extract soften skin. Skin becomes clear, clean and glowing. Trilogy products are made with 100% natural ingredients and all packaging and products are biodegradable. Contains no Parabens, Petrochemicals, PEG's, Pesticides, GMO's, Harsh Surfectants, Synthetic Dyes and Fragrances. 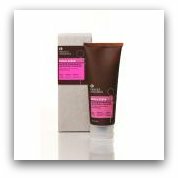 Pangea Egyptian Geranium w/ Adzuki Bean & Cranberry Facial Scrub This scrub gently exfoliates, cleanses, detoxifies and aids in skin cell regeneration and is suitable for all skin types. Adzuki clarifies and exfoliates, antioxidant rich Cranberry supplies nutrients,and Geranium Oil balances skin tone and also aids with skin cell regeneration. This smoothing scrub is gentle enough to be used every day but can also be used once or twice a week along with your regular cleanser. Pangea products contain 100% natural ingredients, are 100% vegetarian and are free of Parabens, Petroleum Products, Propylene, GMO's, Paraffins, Synthetic Dyes and Fragrances. Juice Beauty Exfoliating CleanserThis popular facial product is suitable for all skin types and is in my opinion one of the best natural facial exfoliators. 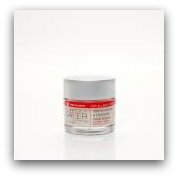 Voted Most Wanted Cosmetic Product by InStyle.com and used by the likes of Kate Hudson and Madonna, you will not be dissapointed with the results. It contains organic grape and pineapple juice which are very high in antioxidants, Aloe Vera which soothes the skin and Grapeseed Oil which provides nutrients and moisture. Dissolving Jojoba Beads cleanse, exfoliates and removes dead skin cells. One of the wonderful things about this cleanser is the dissolving Jojoba Beads. They prevent over scrubbing and damaging the delicate skin on your face. 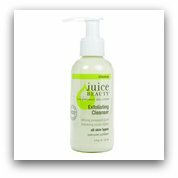 Juice Beauty Exfoliating Cleanser contains certified organic ingredients and is surprisingly inexpensive for such a quality product. Juice Beauty contains no Parabens Pesticides, Petroleum, Propylene, Butylene Glycol, Sodium Laurel Sulfates, Phtalates, Synthetic Dyes and Fragrances. Kimberly Sayer Gentle Almond and Lavender Face Scrub This facial exfoliator is suitable for all skin types and is gentle enough to be used every day. Made with Almond Meal, Jojoba Beads and Oat Beta Glucan this product is non abrasive and will not scratch or damage skin. It also provides protection from outside elements and has anti aging benefits. 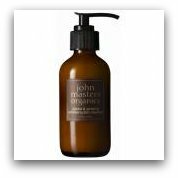 John Masters Jojoba & Ginseng Exfoliating Face Cleanser This exfoliating cleanser nourishes, reoxygenates and is suitable for all skin types but very beneficial to mature skin. Genseng helps improve circulation, reduce the appearance of fine lines and also firms skin. Wheat Germ Oil softens skin, Bearberry acts as an astringent which reduces pore size and brightens skin's appearance. This product is free from Parabens, Petrochemicals and other harmful ingredients. Try one of these natural facial exfoliators and enjoy fresh, glowing, more youthful skin!